This single-type model is designed for installation on a side wall of a cabinet or closet. Features a shock absorbing mechanism to control the speed of the handle, even when released halfway. It will stay at position when the rod is pulled all the way down. 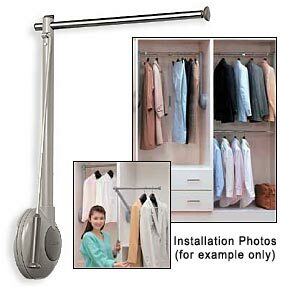 Flexible pull-down rod allows the Tallman to be pulled down from various angles for easy access. Easy to use and return the rod to its normal position. Easily installs by securing mounting plate to wall and fastening rod unit to the mounting plate with one hidden screw. Note: This product is also known as TAS-800L/G on other websites. Warranty: Lifetime finish warranty. Includes all necessary mounting hardware.